"This is a nice tender cake - one of my Mom's specialties from years ago. It is a great cake to take along to a picnic." 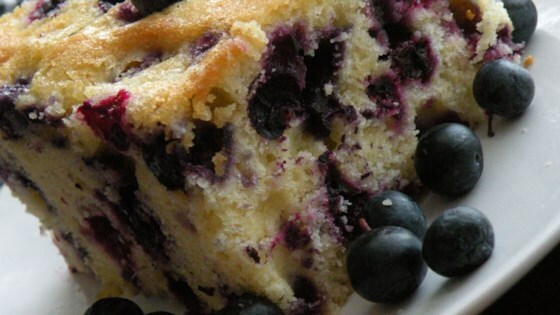 The best Blueberry Cake. I made it with frozen blueberries and used a 9 inch pan. This was delicious! It was incredibly moist! I was a bit worried when I was mixing the ingredients, because the dough seemed really thick, but it turned out lovely! This is a very good cake but it does taste like a blueberry muffin. The batter is really thick so don't be alarmed when you make it. Next time I will add cream cheese frosting. Where has this cake been all my life? I followed the directions precisely and the cake is out of this world fantastic! Yuck! I love blueberry everything, and this tasted really bland. I was embarrassed to serve it to my friends.